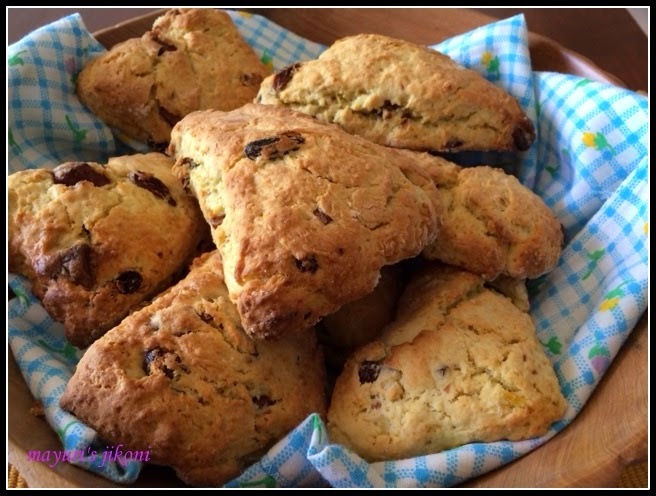 When Priya challenged the Home Bakers Challenge group to bake scones, I got excited. Excited because I love scones, because I have so many scone recipes in my recipe book but never tried any and because now I had to bake them! My cousin Jayshree is an expert at baking scones. She baked some during my last visit to London and invited my sister in laws and me to her house for early breakfast…. tea or coffee with scones. She served them with some jam, butter and clotted cream. Took one in my plate, finished it with some hot tea, then had another one. She kept on insisting we have more, but the mind was saying no and the taste buds were saying yes yes. So my sister in law and I shared one. By the time we left her house, we were just too full. We had some work to tackle but couldn’t. Had to plop in front of the telly and let those scones with dollops of clotted cream, digest. I kept on putting off the task hoping that the rains would cool the atmosphere a bit. We are suppose to be into the rainy season but its still so hot. Couldn’t put the task off for too long so embarked on it today. After rubbing the butter into the flour, I had to put the flour in the fridge for a while to let it become cold again. I had to work really fast as I felt that the dough is going to become too soft because of my hot kitchen. Its actually not very difficult to prepare scones as long as one is follows a few useful tips. Scones are small biscuit like cakes either sweet or savoury made from flour, fat and milk, cream or yogurt.Fruits or vegetables are added to it. Some recipes add egg and some don’t. A bit crunchy on top and cake like texture inside. They are usually served for breakfast or tea. Scones and tea is a classic combination. During my trip to Scotland, I had the yummiest scones with tea in some of the tiny cafes near our the apartment we had rented. Here’s my recipe for scones. Do you find that some of the smaller cafes are much more friendlier than the standard cafe days, starbucks, nero, etc? Line the baking tray with parchment paper or lightly grease it with butter. Sift flour, baking powder, soda bicarbonate and salt together into a big bowl. Add sugar and orange zest and mix. Cut into tiny pieces or grate the cold hard butter into the flour. Using just your finger tips, rub the butter into the flour. This action also helps to incorporate more air. Whisk egg and yogurt together in another bowl till its smooth. Add the liquid mixture into the flour mixture and mix with a fork. Large dough clumps will be formed. Gently press it into a dough using your hand. It should be slightly sticky and not dry. Lightly flour a worktop. Place the dough on it. Pat it into a circle of 7 -8 ” in diameter and about ¾ ” thick. Using a sharp knife or pizza cutter, cut the patted dough into 8 wedges or triangle. Place the triangles on the greased baking tray. Make sure they are placed about an inch apart as they increase in size on baking. Place the tray into the preheated oven. Bake for 15-17 minutes or till the scones are golden brown. Remove the scones from the oven and place them on a wire rack to cool for 5 minutes. Serve warm scones with whipped cream, clotted cream, jam and butter. Make sure the bowls and cutting knife you use are cold and not warm. I used thick yogurt instead of sour cream. I cut the butter into smaller pieces as grated butter would have melted faster in my hot kitchen. The dough should be slightly sticky, pliable and light. Instead of triangles you can pat the dough and use a cookie cutter to make round scones. Pat the left over dough again into a circle and cut. When you cut with a cookie cutter don’t twist the cutter into the dough, just press it down. Flour the knife or cutter so that it does not stick to the dough. These scones have superb texture! Yes! Even I find the local cafes to be more authentic & congenial than the branded ones…guess it's the effect of standardization!! Perfectly made scones.. never tried my hand at making these still.. They tasted great also especially the combination of orange and chocolate. Go on Shobha, try them out… its quite easy.